Easter Hand Bells Prelude: 9:15 A.M.
Sunday School & Adult Bible Study: 11:00 A.M.
We believe that the process of being and making disciples involves Christian education and nurturing through the Word and Sacraments. We carry this out through Worship, Bible Study, social ministry, youth ministry and our personal stewardship. Activity is a large part of the life of St. Paul’s. There are many opportunities to be involved in the various ministries that we have, and there are many levels of involvement as well. We strive to take care of those who gather in our fellowship as well as to be involved in the community! 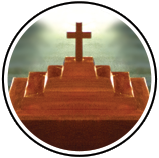 We are a member of the Lutheran Church—Missouri Synod and we are committed to the doctrine that is presented in The Book of Concord. We are dedicated to gathering in liturgical worship, to growing in the faith, and to living out the life of a Christian as we go into the community around us. The mission of our preschool is to provide a safe, Christian, child-centered environment for children of all races, colors, ethnic origin, religion, socio-economic background, or physical or mental handicap, if the child's needs can be effectively accommodated within the center structure.